You’ve spent months, in some cases years, on planning and preparing for your wedding day from managing to secure your first choice venue on the day of your 5th anniversary to saving your hard earned cash to buy that new season Monique Lhuillier ‘Geneva’ dress. The last thing you want to think of is of anything that could potentially go wrong on your big day, the very day that you have planned down to a tee. I mean, what could go wrong right? Anything and everything. We’ve put together 7 of the most common wedding day mishaps and how you can avoid them, or if not, recover any expenses incurred. You’ve planned your dream outdoor wedding beside the river in the height of summer to ensure that your chances for optimum sunshine are 101%. When the big day comes, a freak storm rolls in, armed with a month’s worth of rain and causing the river banks to burst at the seams. Unfortunately, mother nature is beyond your control and even with today’s technology, weather forecasters can still get it very wrong. Weddings are typically planned so far in advance and is reliant on so many components coming together on the same day, it’s hard to predict what the weather will be like when that day eventually arrives. Whilst you’ve got a stronger chance of having better weather for an outdoor wedding in Australia than somewhere like the U.K., the elements can still go against your well thought out plans. Whilst you cannot stop the storm from gatecrashing your big day, you can prepare for the worse. Having a backup is always a good idea, whether that be a marquee in your parent’s back garden or a space that is available at short notice (or pre-booked if you can afford it). If you don’t have a backup plan to save the day then having wedding insurance up your sleeve is a smart move. Not only will you be covered in the event of a cancellation if the venue becomes untenable but the rescheduling of your wedding to another, hopefully, sunnier day void of any rain. Make sure you check the details of your policy to establish the timeframe within which your rescheduled day must take place otherwise you may have to fork out for this from your own pocket. Find out which celebrity couple had a close call with not one but two natural disasters in our Real Life Celebrity Wedding Disasters post. 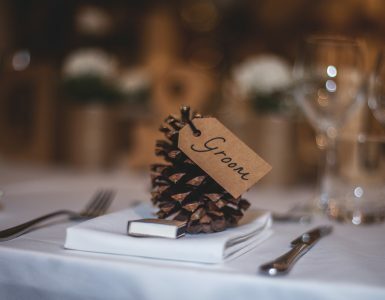 Having your wedding guests arrive late, whether it be for the ceremony or the reception, can be infuriating (especially for those who are always punctual and would rather not turn up somewhere than to be late). Whilst wedding insurance won’t cover you if your guests arrive in dribs and drabs, you can plan for the worse especially when it comes to those you know are guaranteed to be late to the party (you know which ones of your friends and family they are). Tell guests to arrive 30 mins to an hour earlier that the actual start time and have some refreshments on hand to occupy them until everyone arrives and you’re ready to start. It’s a sensible idea, in general, to build extra time into your scheduled day as a buffer should things start to tail behind. You’ve flown to the city where you and your groom first met for an intimate ceremony the next morning but your groom’s luggage goes missing. Whether it didn’t quite make it onto the plane or someone has mistakenly picked it up as their own, either way, his Italian, custom made tuxedo is nowhere to be seen. Whilst this might be very stressful, wedding insurance will cover the cost of a replacement if lost, stolen or damaged. Of course it’s not the ideal situation and leaves you with very little time to find alternative attire or to rent one, but the groom won’t need to worry about having to splash out the extra cash that’s been put aside as spending money for the honeymoon or the impending work on the loft extension in the new house. It can be quite nerve-wracking to think how much you will depend on others such as suppliers/vendors to ensure that your special day runs smoothly. Some of it can be planned for such as having a backup on standby and, in most instances, that will be more than enough. In the event that your DJ falls sick, make sure the contract covers a replacement or you can have a trusted friend recommend someone they know who is happy to be called upon last minute. However, for the unforeseeable e.g. the bakery responsible for your 3-tiered, white chocolate and raspberry wedding cake files for bankruptcy the day before and all outstanding orders are cancelled, wedding insurance can help to alleviate the pain. Any deposit/payments made can be recouped through your insurance policy. Guests might just have to go without cake. If the river bank managed to withstand the torrential rain or you’ve resorted to your marquee backup plan in your parent’s back garden for shelter, flooded roads could cause unforeseen closures to and around the venue. Such closures would mean no cars including the those booked to transport your guests from the hotel to the venue, so unless you and your guests fly in via a chopper, there’s no way of getting to the secluded, hilltop chapel. On top of this headache, the transportation company refuses to repay your deposit. Again, another typical example of elements beyond your control and that can bring your wedding day dreams on its knees. Unless you have a plan b, you may have to postpone your wedding day. Those who have taken out wedding insurance can rest assured that any advance payment lost to the transport company can be reclaimed in full and postponement of your wedding day if need be, will be covered also. It’s probably one of every bride’s biggest nightmare that something should happen to the wedding dress before the big event. After investing so much time in scouring for the perfect dress and the countless number of fittings up until the big day to ensure that the gown fits like a glove, it needs to be perfect. Then during the chaos on the morning of the big day, when your maid of honour is helping you into your gown, she trips over the train and causes a tear in the tulle. Your heart sinks so deep that you don’t think it will ever be retrieved. Breathe. Whilst you may not even want to dream of something like this happening, these accidents are only far too common. And when they do happen, be armed and ready. Pack yourself a ‘survival kit’ and include anything and everything that might help you get through the day unscathed. Cotton and thread (make sure it’s in the right shade or close to it as possible, and pack another in the colour of the groom’s tux should he incur an accidental split at the seams) can quickly hide a multiple of sins or, in this case, a tear. Whilst wedding insurance won’t be able to magic away a torn dress, it will be able to help pay for the repair work to be done so there’s a more permanent fix to a piece that will no doubt hold immense sentimental value. Other things to consider for your survival kit are: tissues, lash glue, lipstick/gloss for touch-ups, face powder, painkillers, bandaids, anti-histamine, tape, safety pins, hair grips, nail file, and a phone charger. From chairs and tables to the big white marquee, you’ll likely be hiring equipment for your wedding day. With so many people in one space, there is almost always an accident waiting to rear its ugly head. Amongst all the fun, wedding day shenanigans, and not to mention with plenty of booze flowing, your aunt knocks over a candle which causes the marquee to catch alight, only to be heroically put out by your uncle but not before tripping over the leg of a chair and snapping it clean off. All equipment damages will be added to the cost of hire but with wedding insurance, you’ll be able to claim them back. This often falls under public liability and is often sold as an add-on to a basic wedding insurance policy so it’s very important for you to know what is covered and what isn’t. Should your uncle incur an injury as a result of the fall, with public liability covered in your insurance policy, rest assured the cost of treatment or medical attention is taken care of. Whilst wedding day mishaps are common, a lot of the time these will be small and can be sorted quickly and quietly. However, considering the huge investment a wedding day can be, not only in financial terms but also in the time taken in the planning not to mention the emotional ties, are you willing to risk having to cough up an arm and a leg should something go terribly wrong? With wedding insurance, you can have peace of mind that even if the unforeseeable happens, your expenses can be taken care of with the right level of cover in place and at a relatively inexpensive cost.